Do the Japanese find it fun to stick your finger into a box and play with torment digital beings all in the name of fun? Who doesn’t?! Bandai Japan seems to think so too. 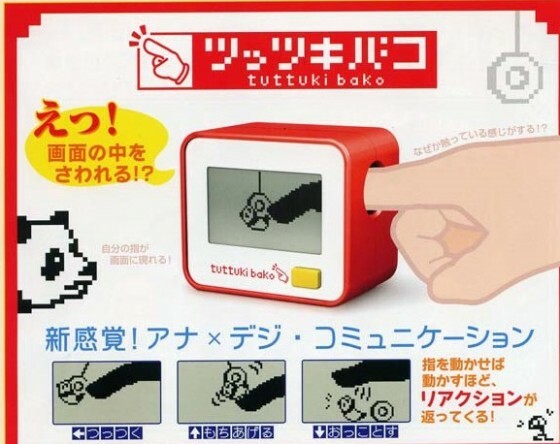 They have created this toy called the Tuttuki Bako (Tuttuki Box). .
How it works is you stick your finger into the side, and a digital index finger represents your own on screen. You then have the option of terrorizing a small stick figure man, playing with a lovely girl’s face, pick at a gooey slime ball, explore a digital lake, or swing a tiny panda.